Is girls chess 'nicer' than boys chess? Since the Candidates tournament, Vladimir Kramnik hasn't been having the best of times. He dropped out of the Norway Masters event, and then finished last in the Tal Memorial. He then fronted up to the Geneva Masters, which is a new event using a 5 day Rapidplay format. It started with 8 players, split into 2 groups of 4, playing a round robin. Based on the slightly complicated scoring system (3 points for winning a 2 game match, 2 points for winning the match on tie-break, 1 point for losing on tie-break, and 0 for losing a 2 game match), the top 2 players qualified for the finals. At the end of day 2 it looked as though Kramnik's run of outs was continuing, as he only seemed an outside chance of qualifying for day 4. However he lifted himself up, making the semi's where he then dispatched Nakamura to reach the final against Mamedyarov. The tournament website is here. (One name I've spotted as a commentator is Cathy Chua, a former Australia representative, although more noted for her involvement in Bridge in recent years). Just settling for three weeks of late nights with the start of the 2013 Tour de France. I'll pick up the early coverage courtesy of SBS, while whatever iPad apps I can find should deal with the 'just about to fall asleep' section of the race. I may even be in Europe for a short period while the race is on, but even then the closest I'm likely to be is 2 countries away! Later this year is the 2013 FIDE Congress. Originally Turkey was to be the venue, but it has now moved to Estonia. As it is an odd numbered year there was supposed to be no General Assembly, but due to recent constitutional changes one has become necessary. However, as GA's go, this may be the shortest on record. The reason for having one is to appoint an Electoral Commission to oversee the FIDE elections in 2014. While I have idea how controversial this might be, I believe the whole GA is scheduled to last around an hour. As it happens I plan to to be in the UK at that time, albeit on a family holiday (making it easier to justify the expense of going). Originally I planned to spend a few days at the Congress attending a couple of committee meetings (Swiss Pairings, plus Rules and Tournament Regulations), but it seems I am now hanging around a little longer. This has thrown my holiday schedule into a spin, but as a consolation I will get to a bit of Paul Keres related sightseeing. The University of Western Sydney Chess Club is hosting the 2013 Inter-University Chess Tournament on Sunday 7th July. This is a teams event for teams of 6 players, and will played as a 1 day rapid event (G20m+10s, 5 rounds). The venue is the UWS Parramatta South Campus, which is at the corner of Victoria Road and James Ruse Drive, Rydalmere, Sydney. Alongside the teams event is an Individual Rapid, for players who aren't part of an organised team. Team qualification is pretty relaxed, as it is open to current students, current staff or alumni. So even if your university days are long behind you, you still may be able to represent your alma mater. In the past I've mentioned my dislike for ornate chess sets, which have occasionally been purchased for me as a gift. A simple Staunton designed chess set is all I need for most occasions, and anything above that is needless frippery. However I don't mind fancy sets that come with computer chess programs. While I was not that 'into' Battle Chess when it first came out, I did see the appeal of it to non-serious chess players. Even to this day when I talk about chess to work colleagues and non-playing acquaintances, Battle Chess still gets a regular mention. Given the appeal that Video Games/Chess crossovers have, it is hardly a surprise that new products in this genre are still being released. The latest one I've spotted is 'Chess War - Borodino' which is a chess playing program with a Napoleonic's feel. The design of the pieces is based in the French Army from around the time of the Battle of Borodino, and as usual, each movement or capture is accompanied by a little animation. Apart from that it is a pretty straightforward chess program, albeit with some nice graphics. It runs on both the iPad (for 99 cents) and Android devices (free but with ads), and you can by extra content if you so wish. Oddly one of the extras is the ability to play Fischer Chess (for an extra $1.99) but in the app they called is 'Fisher' Chess. As for its strength, it started of giving me a challenging game on the default setting, but eventually missed a two mover and lost all its pieces. I'm sure it will play better on the harder levels (as most programs do). Here is a nice attacking win involving a couple of lower rated players from last months Liechtenstein Open. What appealed to me about this game was White opened with 1.Nc3, which I played for a while in serious games, and still do in Blitz. The game does transpose back into a French Defence after a few moves, but White is still able to pile on the pressure, before finding a clever finish. The further technology advances, the more of the past it reaches. Certainly this seems to be true of modern media, where the advent of digital data storage has allowed many old movies, music and television shows to reappear, decades after they first came into existence. One such piece of historic chess media is the movie 'Chess Fever'. Made during the 1925 Moscow International, it is a silent comedy about a man who is obsessed with chess, so much so he misses his own wedding ceremony. There are a number of cameo appearances of famous chess players of the time, including Jose Capablanca, who has a significant part to play in the film. I've come across a copy of the film on youtube, and it even includes English subtitles. If you wish to see this piece of history, then click here. In a somewhat surprising outcome, Boris Gelfand is the outright winner of the 2013 Tal Memorial. He drew his last round game with Vladimir Kramnik quite quickly, and watched as his closest rivals failed to close the gap, after most of them also drew. Not only did the draw gice Gelfand first place, but it also relegated Kramnik to last place, assuming Morozevich converts his overwhelming advantage against Nakamura. Top seed Magnus Carlsen finished outright second, half a point behind Gelfand, while Dmitry Andreykin finished equal third. Andreykin was the highest placed Russian player, well ahead of Karjakin, Morozevich and Kramnik. Caruana and Mamedyarov would both be happy with their joint third finishes, while Nakamura may be wondering if his 'take no prisoners' approach gave him the result he deserved. 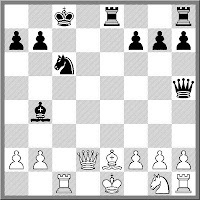 At the sake of repeating myself, I once again find myself looking at what would be the earliest opening novelty in a game of chess. Obviously 1 move novelties for White are out, as every opening move has been played at least twice. However I managed to find at least one game where Black has played a unique move on move 1. I started with the assumption that 1.h4 might be the least popular opening move and saw what replies were made to that. There have been 14 different replies, but 1. ... h6 has only been played once. But before you go delving into what this means for modern opening theory, it looks as though the game was a contrived effort as a draw was agreed after 10 moves. A barrier of pawns has been constructed across the board, and the players decided that was enough. 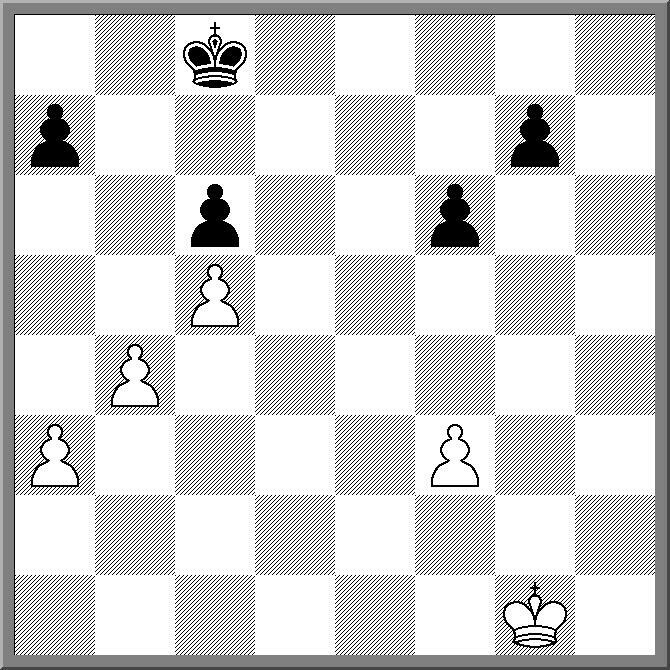 Interestingly if you do have to face 1.h4 you may want to try 1. ... a6 as a reply. Not because it is any good, but simply because no one else has played it yet. "Think with your head, not with your hands" is a piece of advice I often give my students, especially when they are staring out. To this I may have to also add, "Think with your head, not with your eyes"
As part of some basic training exercises I gave them a number of positions where they had to spot the 'free' piece. It was a piece that could be captured for 'free' as normally there were no other pieces protecting it. Most of the positions were pretty easy (deliberately so), but I did throw the odd tricky position in. The diagram is an example of one of the tricky ones, and it caught most of my students out. They all wanted to grab the queen on h5, missing that bishop on e2 was pinned. The correct answer was just as much a surprise to them as well, as they missed that the knight on c6 was also pinned! But what was the real surprise to me was when I included it the set of questions for the following week, most of them chose the wrong answer a second time. What I think this means is that as a group they have moved to the level when they can 'see' moves, but are yet to progress to 'understanding' moves. Hopefully this will change over the next few months. When I see a game like the one below, I often wonder how much home preparation is involved. Played in the latest round of the Tal Memorial, Vladimir Kramnik gives up a rook but in return generates enough threats against the White king to force a repetition. My database has the players following theory up until 13.f4, and Stockfish quickly spits out 13. ... h5 as the best reply. Therefore I would not be surprised if Kramnik had looked at this line in the past and found enough fantastic moves to render it playable. 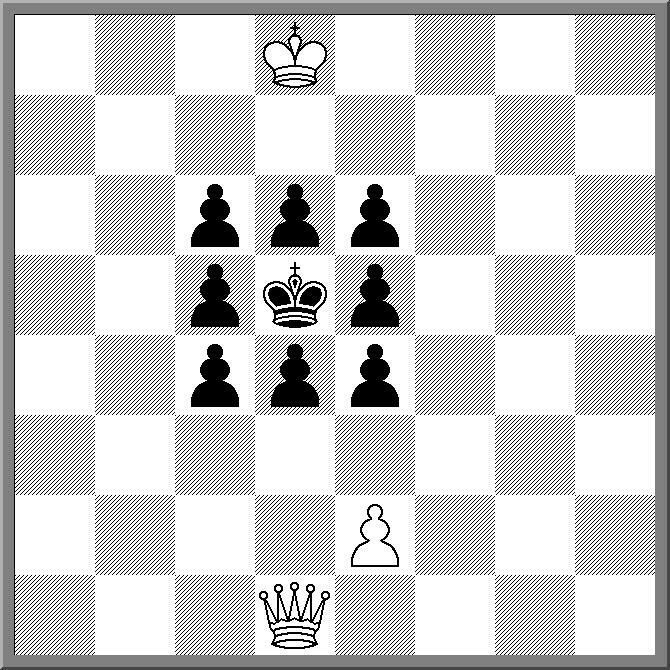 A cute problem where the Black king starts off surrounded by his own pawns. Clearly a composed position, as it would be difficult to image a sequence of sensible moves that would lead to this arrangement. White to play and checkmate on 4 moves (Mann 1907). The 2013 ANU Open is happening in around 6 weeks time. This popular 2 day event turns 21 this year, having first been held back in 1993. It is a 7 round tournament split into and Open and Under 1600 sections. There is a prize pool of $3300 ($1000 1st prize) and the entry fees are a very affordable $75 ($50 concession junior). There is even a $10 discount if you enter before the 19th of July. Courtesy of the FIDE website comes the news that Tshepo Sitale has been awarded the Sports Administrator of the Year by the Botswana Sports Council. This is both a well deserved award, and quite a big deal, as Chess is one of the major sports in Botswana, after Football and Athletics. One of the reasons that it is such a big sport in Botswana is due to the efforts of the younger generation if chess administrators in that country. Every now and then Anatoly Karpov pops up playing an exhibition match or rapid, but for all intents and purposes he is retired as a top level player. What occurred to me when seeing news of his latest exhibition is that I'm not sure when he actually retired. Unlike Kasparov (explicitly) or Fischer (implicitly) there was no dramatic announcement, just a gradual withdrawal from serious tournament play. And Karpov would not be alone in bowing out this way. While age is no physical impediment to playing chess (unlike other sports), it may bring a decline in interest and enthusiasm. Certainly a number of strong GM's simply played less and less as they got older. Of course there are some notable exceptions (eg Korchnoi), but even older GM's seem to gravitate to either Senior only events, or specific tournament designed to cater for them. I'm not sure the same thing happens in club/weekend chess, as the fields still contain a healthy number of older players. Of course the work dynamic is at play here, with amateur players retiring from their careers to spend more time at the board, with professional players retiring to spend less time at it! I helped run the ACTJCL North Canberra Primary Girls Teams Championship last Wednesday, and it was a thoroughly enjoyable experience. Almost uniquely among the tournaments I have directed over the past 30 years there was not a single dispute, misreported result, temper tantrum or tears. Everyone seemed to enjoy themselves, and while there was obvious competition for the top places, it seemed that no one begrudged the success of the other teams. In how many other 100 player chess events do you see that happen! The next of the Super-GM events has kicked off this evening, with the 2013 Tal Memorial starting in Moscow. Once again the majority of the worlds elite have been invited, along with a couple of 'local picks' (Gelfand and Andeikan actually). The tournament started with the now traditional blitz event which allowed the winner, Hikaru Nakamura, to pick his own starting number. This may have not been as helpful as it looked, as he happened to the be the first player to finish in the opening round. Unfortunately he got carved up pretty badly (and quickly), by Shakhriyar Mamedyarov. At the time of writing, the rest of the games are still in progress, with the position relatively balanced. The Closed Sicilian seems to be paying off for me recently, as I have scored 3 brutal wins with it in the last few weeks. Part of the reason why it has been working is that my opponents seem to be choosing systems involving an early Nf6, which make the g4-g5 push all the more dangerous. At the same time the temptation to target my queenside pawns often leaves their pieces on the wrong side to defend. My most recent win was might be termed a 'flawed' brilliancy. Certainly it looks good, as I sacrificed a knight, then a few pawns (although I got the piece back), then the exchange and finally my queen. However I missed one crushing move (26.Rxf6!) and my opponent missed one good defensive move (28. ... Qb7!). But given part of my rationale behind the attack was to force him the find the correct defensive moves, I'm going to take it as a very pleasing victory. I caught the end of the following game at this weekends NSW Open. The first thing I noticed was that the kings were both down the same end of the board, which made it necessary to try and work out who was White and in which direction they were moving. Eventually I realised that it was the Black king that had gone for a walk, but having made it to the other side, was now involved in the mating attack on the White king. White soon realised that there was nothing to be done, and quickly resigned. The 2013 NSW Open has ended in a tie between GM Zong Yuan Zhao and IM Max Illingworth. Illingworth went into the final round a point ahead of Zhao but in a hard fought and exciting game, Zhao won a Knight v Rook ending by hoovering enough pawns to overwhelm the rook. This left both players on 6/7, half a point ahead of IM Gary Lane and Anton Smirnov. The final round saw a number of tough games with players scrambling for good placings. Patrick Champion had just enough to draw with Tristan Stevens, although Stevens tempted fate by offering his opponent a free pawn promotion as a way of avoiding a dead drawn position. As both players were down to their last seconds Champion decided not to accept the offer and a draw was agreed anyway. The half point was enough to help Champion to a share of the Under 200 prize, along with New Zealand visitor Hilton Bennett. There were also good performances from the Willathgamuwa brothers, with Kevin taking joint first in the Under 1850 section and Rowan winning the Under 1700 prize. Full results for this event (and the Under 1600 tournament) can be found here. Day 2 of the 2013 NSW Open saw players get into the swing of things, although 3 rounds in a day was a bit of a stretch for some. IM Max Illingworth leads the tournament with a perfect 5/5, having out manoeuvred Spanish FM Luis Javier Sanchez in the final game of the evening round to finish. A full point behind are 8 players, including IM Gary Lane, IM Andrew Brown, FM Igor Bjelobrk and GM Zong Yuan Zhao. While most of the top players chose to slog it out for 3 rounds today, Zhao took a half point bye in round 5 and might be better rested for the final 2 games. Another player who scored 3 wins on the second day was Nick Kordahi, who scored an upset win over WFM Sengeravden Otgonjarval in round 5. Tomorrow sees the field whittled down to 59 players, although there was no need to cut players at the bottom as enough entrants decided that 2 days of chess was enough and took advantage of the tournaments novel withdrawal policy. The 2013 NSW Open began today, with a field of 119 players. No doubt there were a few players missing due to last minute venue issues, but the organisers seem happy with the overall turnout. Last minute entry GM Zong Yuan Zhao started the tournament as the top seed, while IM Max Illingworth, IM Gary Lane and soon to be IM Igor Bjelobrk filled the next three slots. After the first two rounds all 4 players were on a perfect score, along with 7 other players. Amongst them are Rewais Sarwat and Dan Sakier, who defeated higher rated opponents in the days second round. The Under 1600 section had a much tougher schedule, with 4 rounds being played. Kerry Lin and Michael Tracey are both on 4/4, and will play in tomorrow mornings round. Full results from this event, as well as live coverage of the top 2 boards can be found at the tournament website. I've seen the following scene played out a couple of times on TV shows and advertisements lately. Two players are engaged in a chess game, and a battle of wills, when one player says "You're normally a cautious player who looks at every angle." The other player just nods. Then the first player continues "So the move you've played just looks like a mistake. Maybe you sacrificed your bishop for a better position". As a non-TV chess player this of course irks me. If a game is being played between two players having a chat, moves that look like mistakes are normally just that. And the probability that a piece sac is going to give you a better position is normally quite low. A mating attack, yes. Or even the chance to win back material. But enough positional compensation to justify the loss of a piece? Not in most living rooms/parks I've played chess in. Due to a last minute change with room availability at the Parramatta RSL Club, the organisers of this years NSW Open have found themselves in a bit of a pickle. On the Monday (the final day of the tournament) there will only be space for 60 players. Now as the tournament usually attracts between 130 and 150 players, this has caused the formats to be rearranged. The Under 1600 event will now become a 2 day event (still 7 rounds), with a faster time limit of G60m+10s. For the Open tournament, a slightly more novel approach is required. Borrowing from golf, the organisers have decided that after the first 5 rounds, only the top 60 players will go through to rounds 6&7. Players who 'miss the cut' will be entitled to a 25% refund on there entry fees. I think this offer will be extended to also allow players in the top 60 to voluntarily withdraw after round 5, to reduce the number of players unwillingly excluded from the tournament. (NB I am the Chief Arbiter for this event). of G/60m+10s does not lend itself to deep endgame analysis, and so it proved here. Black had been winning the game earlier (via a nice piece sacrifice that eventually netted a rook), but short of time had popped the exchange. Leading up to the diagram Black had exchanged the last of the rooks on f3 , and was now on the move. What is more important - how we start or how we finish? As alluded to last night I have been busy doing some opening prep for a couple of important club games. One of the games was played tonight, and had a very curious finish. But I'll get to that later. What I had prepared for the game did not come to pass so I am happy to share it instead. My opponent was a Trompowsky player so I looked at a line that goes 1.d4 d5 2.Bg5 Bf5!? Now if my opponent plays anything other the 3.c4 I would just play c6,Nd7,Ngf6,e6 and have a nice solid position. It turned out that after 3.e3 c6 he went for the bishop swap with 4.Bd3 and the game took a different path. What I was really hoping for was a line that went 1.d4 d5 2.Bg5 Bf5 3.c4 Bxb1!? 4.Rxb1 e6! If 5.Bxd8 the Bb4+ wins back the queen with equality while if white ties to get cute with 5.Qb3 then 5... Qxg5 6.Qxb7 dxc! opens up a whole of pain. But none of this happened, and at some point I overlooked a combination that gave my opponent B+N for a rook. So I dug in and tried to stave off the worst. To make progress my opponent began swapping off pawns, but failed to realise the danger. As more pawns disappeared I was able to get my rook active, and eventually got to a position where I offered my rook to reach a KBNvK ending! Fortunately for me my opponent did not know how to force mate, although he did know that he did not know. So he tried to hang on to his last pawn, but after avoiding some small tricks was able to give my rook up for B+P, reaching a clearly drawn ending. The question that was debated after the game was 'Is it worth knowing this ending?' I would say yes, but my opponent felt that his time could be spent improving other parts of his game. I think there is merit in both arguments, so maybe it comes down to personal taste. "Streetfighting Chess" by Andrew Burnett is a book I quite enjoyed. Burnett, a Scottish tournament player, aims the book at players in the 1500-2000 rating group, with the aim of showing how a more aggressive style can improve your enjoyment of chess. Importantly he notes at the start of the book that his book will not make you a World Champion, but that does not stop you from achieving other, more reachable goals. 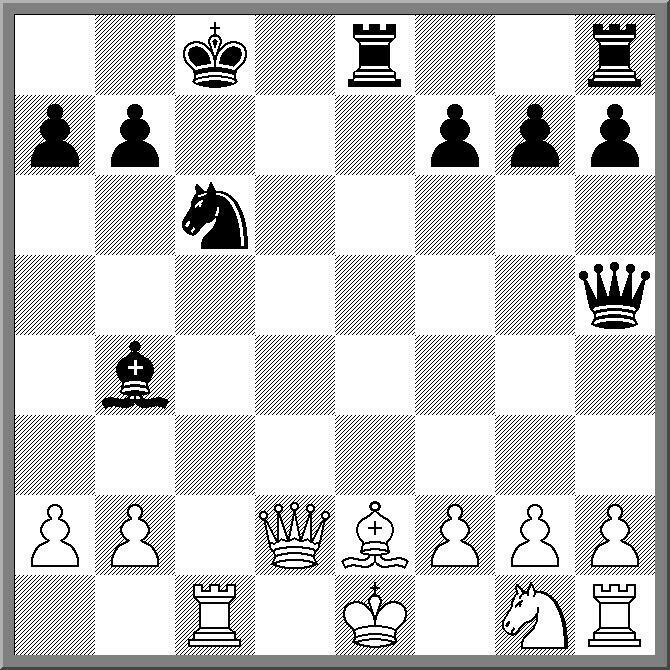 In the book he provides a number of example of "Streetfighting Chess" from his own games, as well as a selection from other players (Tal and Larsen amongst them). The obvious themes in this book are of course tactical awareness and the importance of the initiative. He does however make the distinction between attacks based on practical considerations and the 'mad hackers' school of chess, where multiple sacrifices leave you without enough pieces to effect a checkmate! Sacrifices are a lot sounder if you still have the rest of your army ready to go to work. There is also a healthy dose of psychology in the book, recognising that the reputation as an attacking player can put your opponent on the defensive, even before a move has been played. While not advocating the hollow bluff, moves that pose multiple numbers of questions to your opponents may result in them finding the wrong answer. Overall I found the book especially appealed to me, as it took me back to my early days of chess. Before I tried to be the super serious player, often my tournament were measured in the number of sacrifices I played, as opposed to the points I ground out. Burnett seems to have a similar approach to the game, as he freely admits that not all his moves would escape the scrutiny of an exacting (or computer aided) post mortem. Indeed he is refreshingly honest in his own analysis, pointing out where his missed better moves, or where he mucked up his opening prep. If you are looking for an enjoyable book that is geared towards the average club player, the I would highly recommend this one. I enjoyed playing through the games, and some of his observations on how to conduct attacks were new to me. My copy of "Streetfighting Chess" is courtesy of e+Books which provides chess books via their excellent e+Chess reader for the iPad. The biggest weekend event in NSW, the Integra NSW Open is coming up. This 2 division tournament will be running of the Queens Birthday Weekend (8,9, 10 June) at the Parramatta RSL Club, in Parramatta, Sydney. The is $11,100 in prizes, and based on the numbers from previous years, a field of 120+ should be expected. The 7 round event is in two sections, and Open and an Under 1600 tournament. The Open is FIDE rated, while the Under 1600 event has over $4000 in prizes.